Diane and I ended up having a rare lazy weekend at home, but we managed to get outside for a short hike on Sunday afternoon. 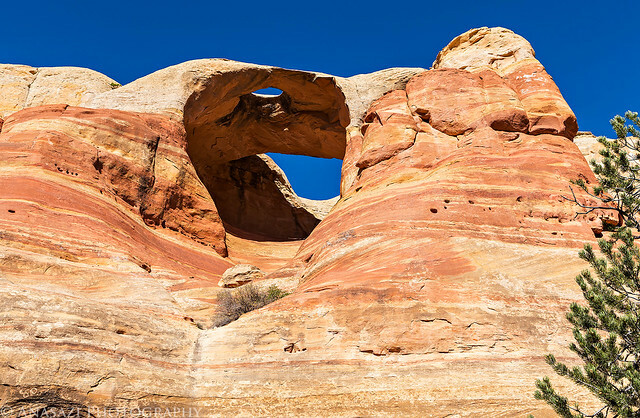 Diane had never been to the Rattlesnake Canyon Arches before and since the upper Black Ridge Road had just opened for the season we decided to visit them. 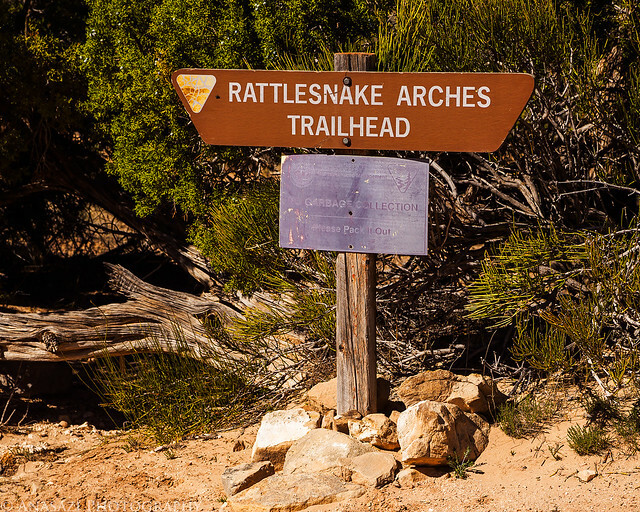 We started from the upper trailhead and followed it down to the main Rattlesnake Canyon Trail until we reached the arches. After reaching Cedar Tree Arch (the end of the trail), we climbed through the arch to the rim of the canyon to shorten the hike back to my Jeep. 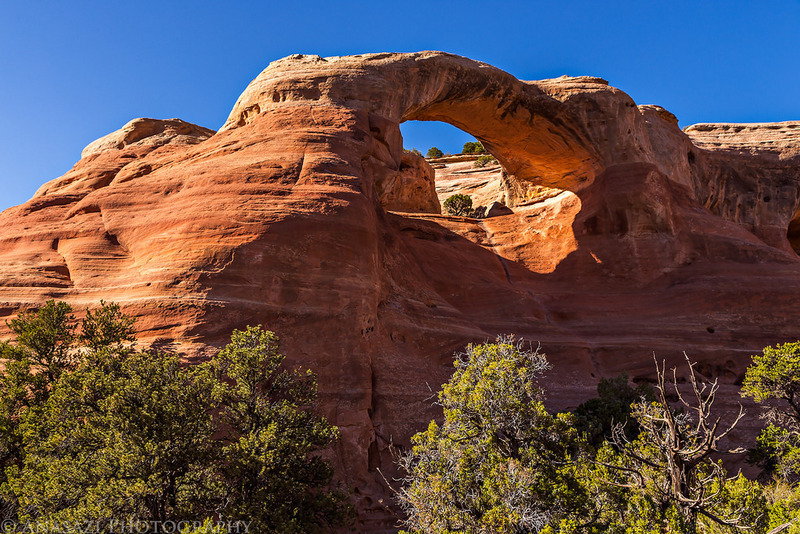 While I have hiked this trail a few times before, I had never felt comfortable climbing through the arch when I was alone. We were easily able to climb through the arch this time with each other’s help and didn’t have to retrace our steps back to the trailhead. With clear blue skies and harsh light I didn’t really take many photos this time, but I do have a couple snapshots that I will share. Sign at the upper trailhead. The Hole in the Bridge is the first large arch we passed. 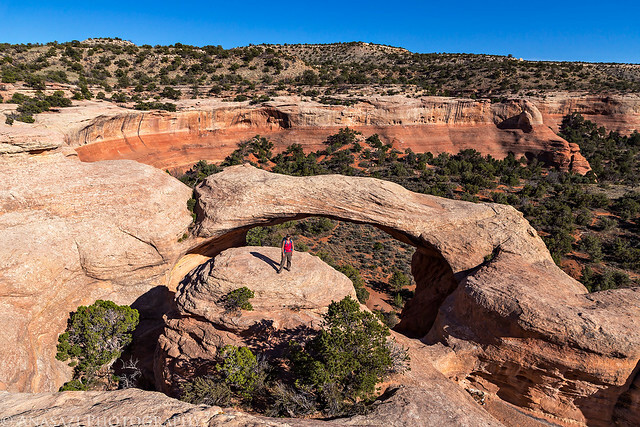 Diane hikes ahead of me under East Rim Arch (aka Centennial Arch or Akiti Arch). Cedar Tree Arch (aka Rainbow Arch) is the end of the trail. We climbed up through the arch to the rim above for a shorter hike back to my Jeep at the trailhead. Diane below after we climbed through Cedar Tree Arch. I’ve included this map and GPS track from our hike for anyone interested in checking out these nice arches near Grand Junction. 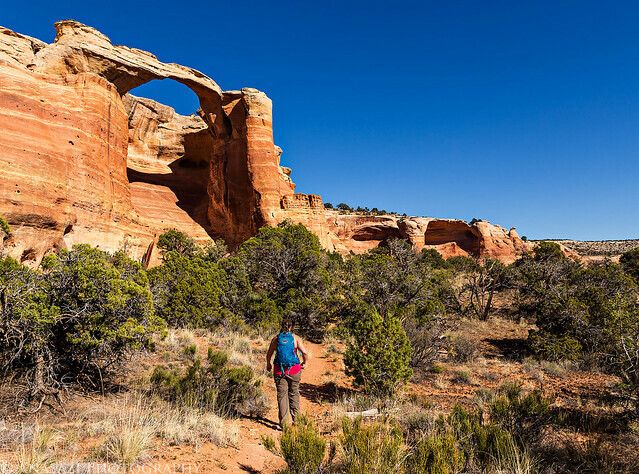 By climbing through Cedar Tree Arch at the end of the trail you are able to make this hike a 4 mile loop.